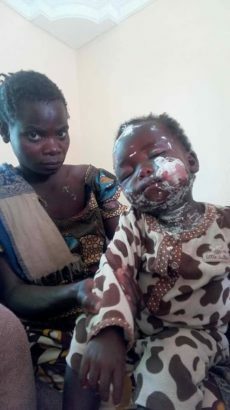 * How a heartless landlady in Zambia poured hot porridge on her tenant’s 1 year old baby during a clash over unpaid rent. The little child was left with severe burns on the face. 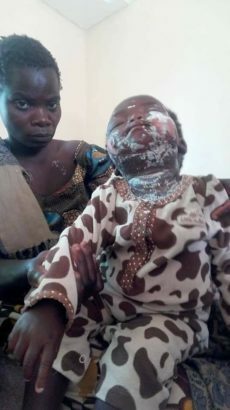 “A Female teacher of Kamwala Primary School who happens to be a landlord of Mr. George Simwinga of Zambia Compound in Serenje District has poured hot porridge on a one year 3months baby. This happened at around 18hrs yesterday when she was claiming to be given K50 rentals which Mr. Simwinga was owing for 2 months being February and March respectively. The baby belonging to Mr. and Mrs. Simwinga sustained serious burns. According to reports obtained by Serenje Radio, the Teacher who is famously known as Bana Paul started throwing things out of the house in the late evening yesterday and later got a hot pot which was burning on the brazier and poured it on the baby who was being held by the father. Mr. Simwinga pays k25 as rentals per month and says he is saddened that such inhuman behaviour could be shown on him by the landlord over a fifty kwacha.